The first ever full genome sequence of a European hunter-gatherer has revealed that hunter-gatherers had far better immune systems that we thought—and evolved blue eyes way earlier than predicted, too. The genome was sequenced from the remains of a 7,000-year-old body found in a Spanish cave after DNA was extracted from its teeth. "This is the first pre-agricultural European genome we have," research Lalueza-Fox told New Scientist. "It will help us to understand how the arrival of the Neolithic era – farming, new diet and new diseases related to animals – has shaped the genome of modern Europeans." Some of the results so far are surprising. 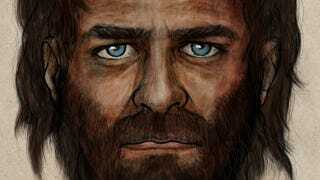 The hunter-gatherer in question had genes for darkly pigmented skin and hair, like his African ancestors, but blue eyes, too, which is more more commonly European. That suggests that eye color evolved before skin color changed—a finding which runs counter to what researchers have believed in the past.